Indonesian citizens with disabilities in different regions cast their votes on election day and create a voter education campaign about the right to vote. 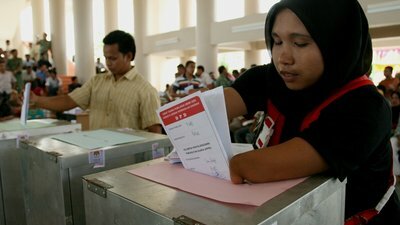 In the Aceh region of Indonesia, citizens cast their votes on election day in 2008. An Indonesian citizen in South Tangerang fills out his ballot in a private booth on election day in 2011. A team of women participate in a video about election accessibility in Jakarta, Indonesia in 2012. An AGENDA conference held in February 2012 encouraged its participants to join a simulation of election day. One version of the polling station is accessible for voters with disabilities (simulated by a blindfold or by using a wheelchair) and one version is not accessible.